Have you had a chance to see how many Thorlabs tubes were in your setup Nathan? I apologize for taking so long to reply. Here is a photo of my current system for phaseone. The phaneOne camera back fits on top. I use 3 of the ~2 inch SM3 tubes, and then one ~1 inch variable size SM3 tube. 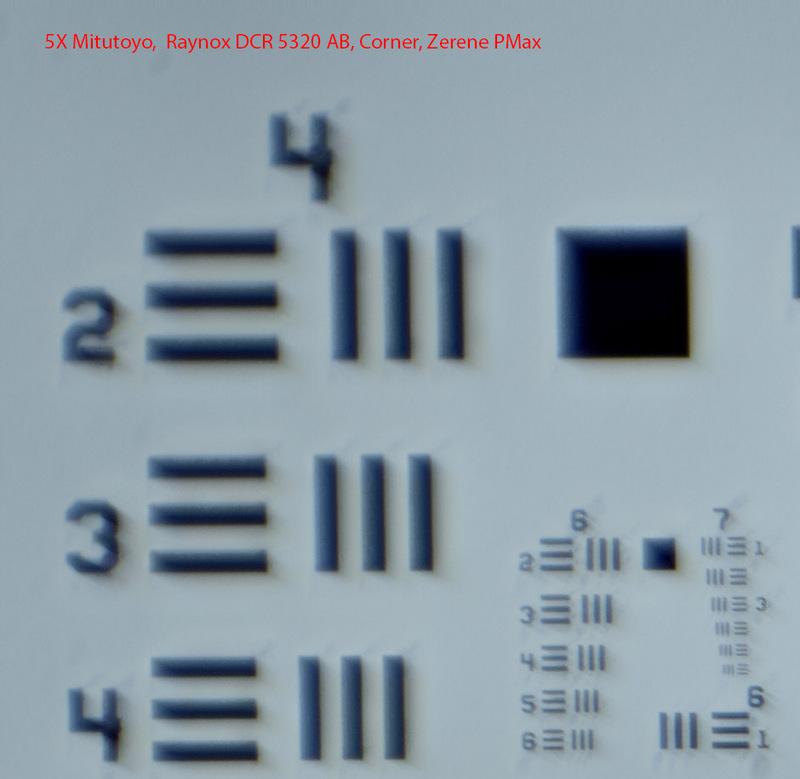 The Raynox DCR 5320 AB has a focal length of 170mm. 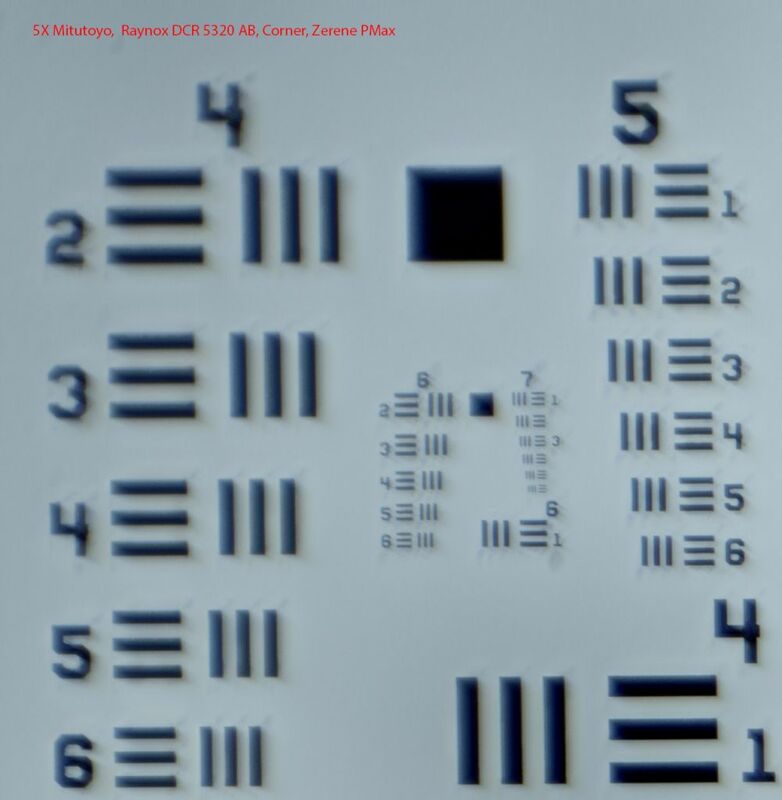 For Canon, the distance from sensor to lens flange is 44 mm. For Canon, I use a 72 mm lens reversing ring. It happens that the thread is close enough to SM3 that it works great. That will be probably ~3 mm thick from flange. By using the 1 inch adjustable length SM3 tube you can focus the system and that will take up the slop for various adapter thicknesses. I also will get around to putting some of the test shots up. Sorry for the delay. Many thanks for the info Nathan. I guess that using bellows instead of the tubes would create vignetting? 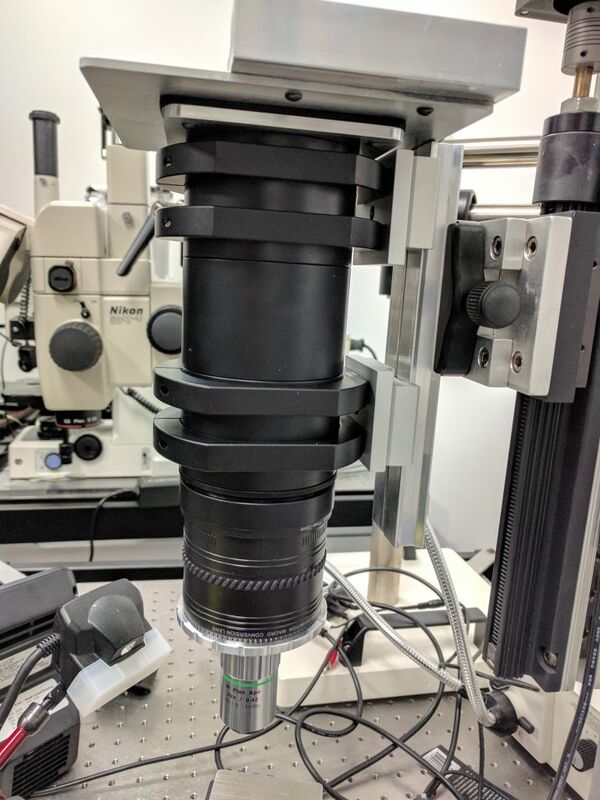 No, a bellows would work too, but since you only adjust the focus ONCE when you set the system up, you don't need to have the flexibility of a bellows. Also, a set of tubes is stiffer. When I set this up I use the variable length SM3 tube to focus at infinity (using live view magnified on a laptop monitor) with the tube lens on, but without an objective. Then the lock ring gets screwed down, and it shouldn't move from then on. A bellows that had the same clear diameter as the tube would not vignette. Note that I use SM3 (3 inch diameter) tube for two reasons. First is the happy accident that 72mm filter thread accessories will screw into it. Second, it is a bit larger in diameter than absolutely necessary and that makes internal reflections less of an issue. In general, the larger the diameter tube (or bellows) the less problem you'll have with internal reflections robbing contrast. Inside the SM3 tube is a 3D printed set of baffles that further reduce internal reflections. That is probably not totally necessary but I have had some reflection problems in the past so I went after it hard. Lining with black fuzzy material like Protostar would probably be fine. Nathan, can I just check the number of tubes. You say that you use 3 fixed SM3 tubes for the Phase One but then you state that only two are needed for the Canon. 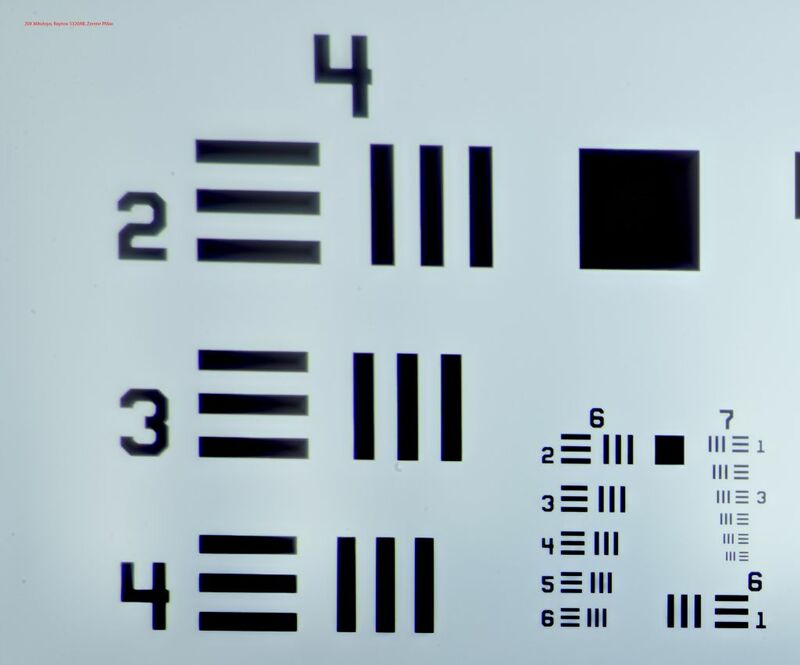 Is this because the lens flange on the Canon is different to the Phase One? I'll be using a Nikon D810. Sorry for the long hiatus, but I have been busy and didn't get all of the results together. At long last here are some example images. 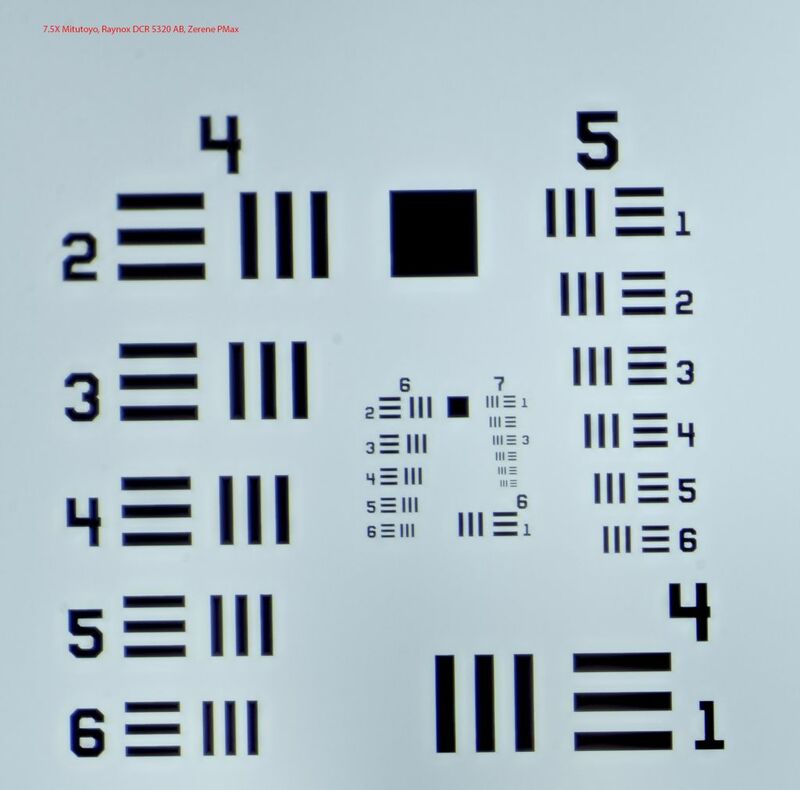 These are 100% crops of a Thorlabs USAF 1951 resolution target, in either the center of the frame, or the extreme upper left corner. They are JPEGs but I cropped them small enough that the forum software would not compress them further. 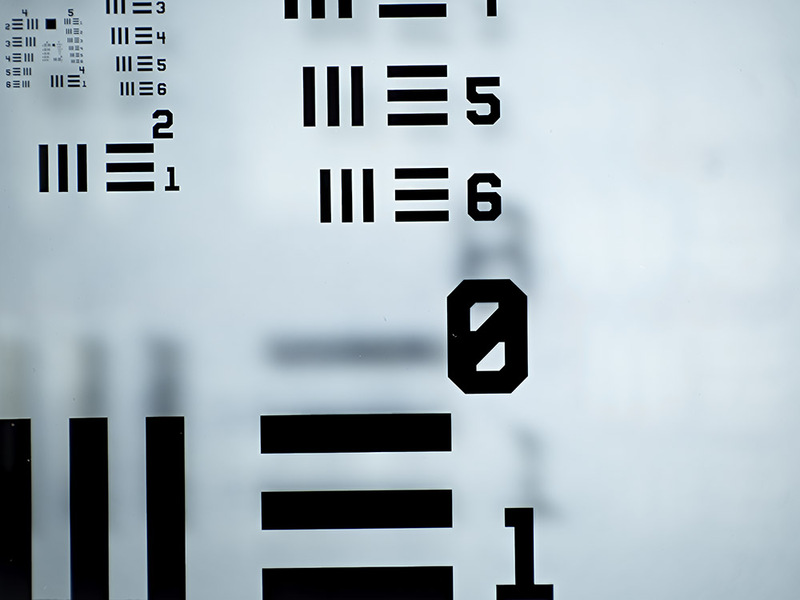 The top and left edges of the picture are the top and left of the PhaseOne frame. Since the frame is 11,000 pixels across and each of these are ~1000 pixels across, this amounts to ~9% of the long axis - meaning it really is the extreme corner. This also means it is <1% of the total area of the image. The pictures were stacked with Zerene using PMax. They are otherwise unsharpened or processed. So there you have it. 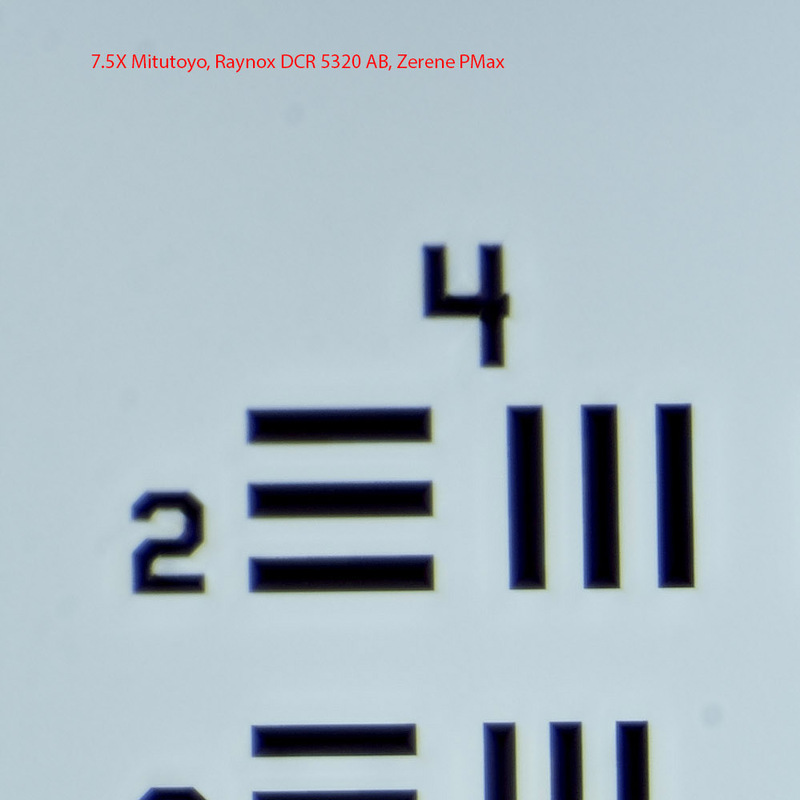 It is possible to cover the 56.7 x 40.4 mm PhaseOne sensor with Mitutoyo objectives, even if the tube lens is a bit less than 200 mm. The corner quality is not the same as the center, but I think that the corner quality is quite acceptable all things considered. Obviously everybody is entitled to their own opinion on that. The fact is I rarely compose really important things in the extreme corners - I don't think many people do. Corner quality is important primarily if it is so bad that it calls attention to itself. This doesn't, especially on real subjects. 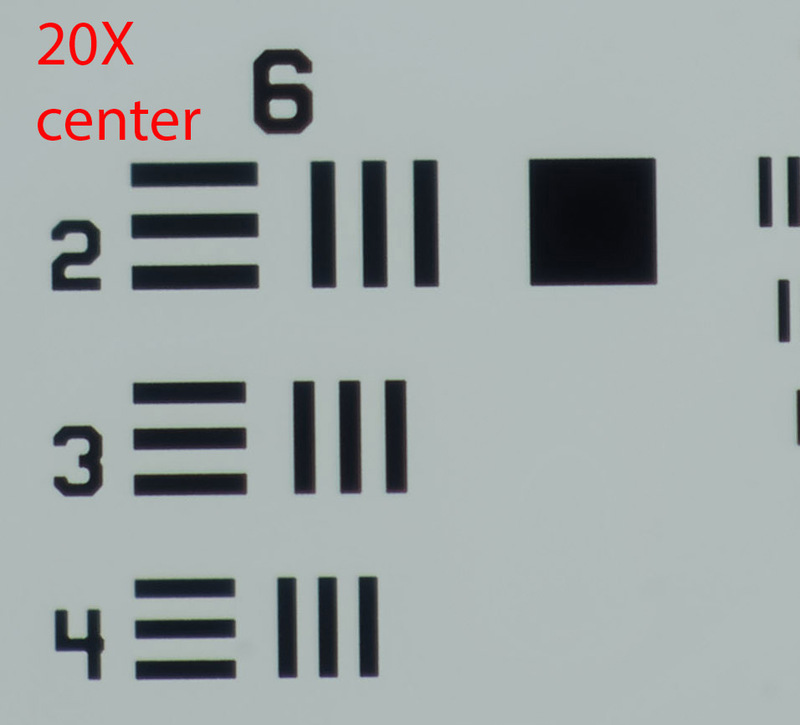 It is interesting that the objectives are not all the same, and a little surprising to me that the 20X has the best corner performance. The 7.5X is the second best. The 10X is the worst. The 5X, 10X and 20X were all from eBay. The 7.5X was purchased new. Some posts on the forum discuss how some Mitutoyos can sometimes be bad - either from poor handling for 2nd hand units or just intrinsically variable (for new ones). On the other hand, the center is pretty great for all of these. The corners in these shots are WAY outside the normal parameters, which lead many people to tell me that there was no way that this would work. I agree that it made little sense that it would work, but I tried it empirically. It could be that the (relatively good) quality of the corners is just an accident of the Mitutoyo design, and that it varies a bit for each design. Nathan, I'm confused, and I'm thinking that some images have gotten swapped or mislabeled. 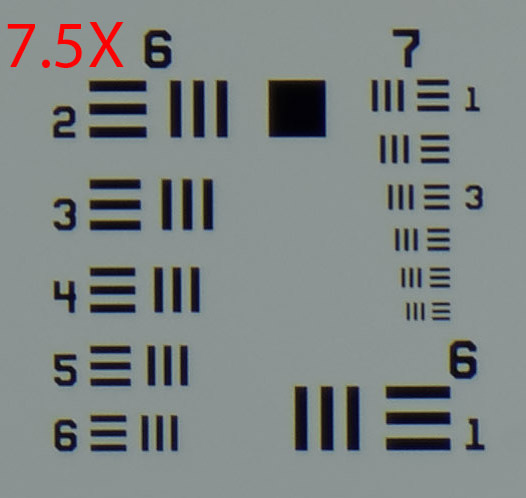 For the "center" images, when I measure the width in pixels of the 6&7 blocks, I get 171, 230, 244, and 788. 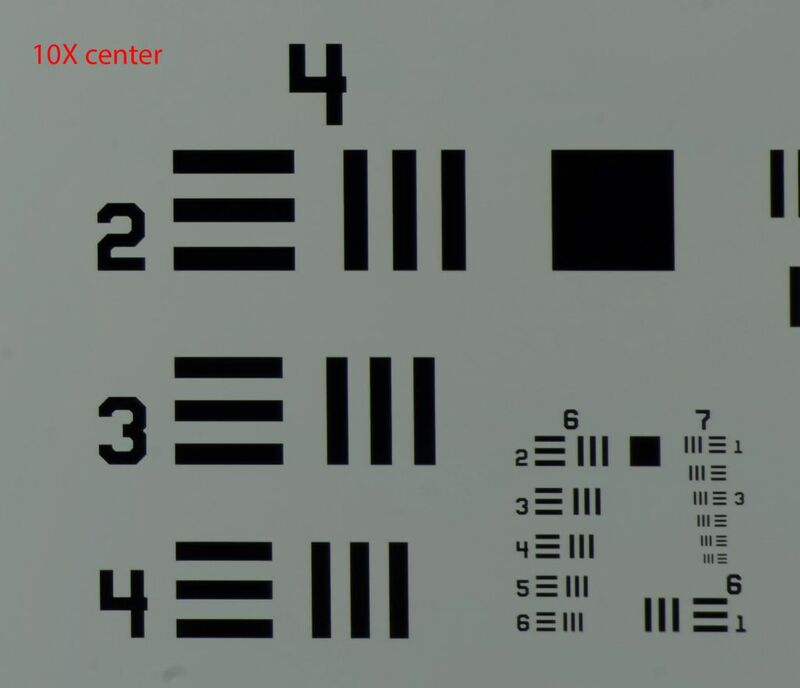 As I understand your test procedures, these should be in the ratio 5, 7.5, 10, 20, but they're actually in the ratio 5, 6.725, 7.134, 23.05. In the corners, the discrepancy is even worse. I measure 191, 175, 504, 241. Should be ratio 5, 7.5, 10, 20, but it's actually 5, 4.581, 13.194, 6.309. 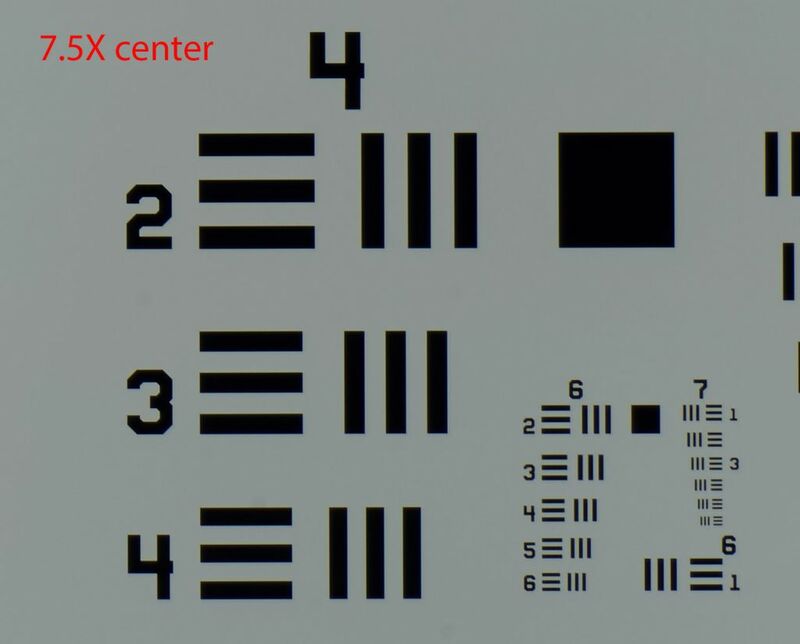 For illustration, here is what I see at this moment for the "corner" images, starting at "5X" on the top and proceeding through "7.5", "10", and "20". Can you clear up my confusion? Sorry about the confusion - if there is a better way to do absolute pixel images let me know. I suppose I should have put them together on one image, then they would be resized, but at least would be resized together. No worries, just so we get it cleared up. What you've done with this last set of images looks fine. For hosting images at photomacrography.net, the basic rule is that if they're 1024 pixels or less, and 300 KB file length or shorter, then what gets served back will be exactly what got uploaded. The centers now make sense, and it's no surprise that they're quite good. But I'm curious about the corners. 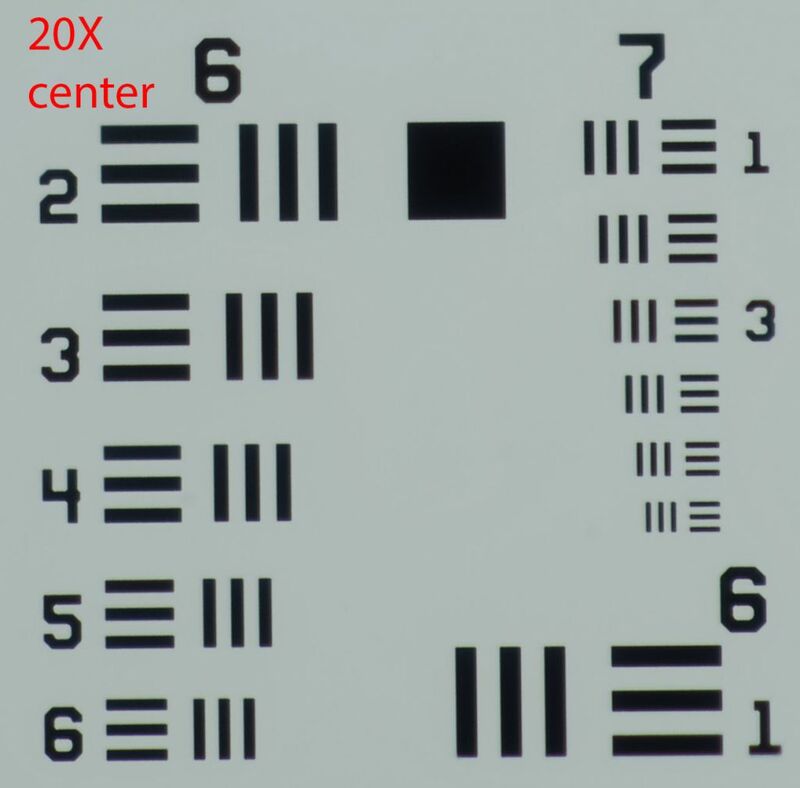 Is it really true that the 7.5X and 20X objectives give corners that are almost as good as the centers, while the 5X and 10X are much degraded? Yes, it really is the case. I think the overall shot makes the point that the corners are not horrible when viewing the overall picture. Here is the corner detail, now cropped so that it won't be resized by the forum software. Top left corner of the crop is top left corner of the frame. 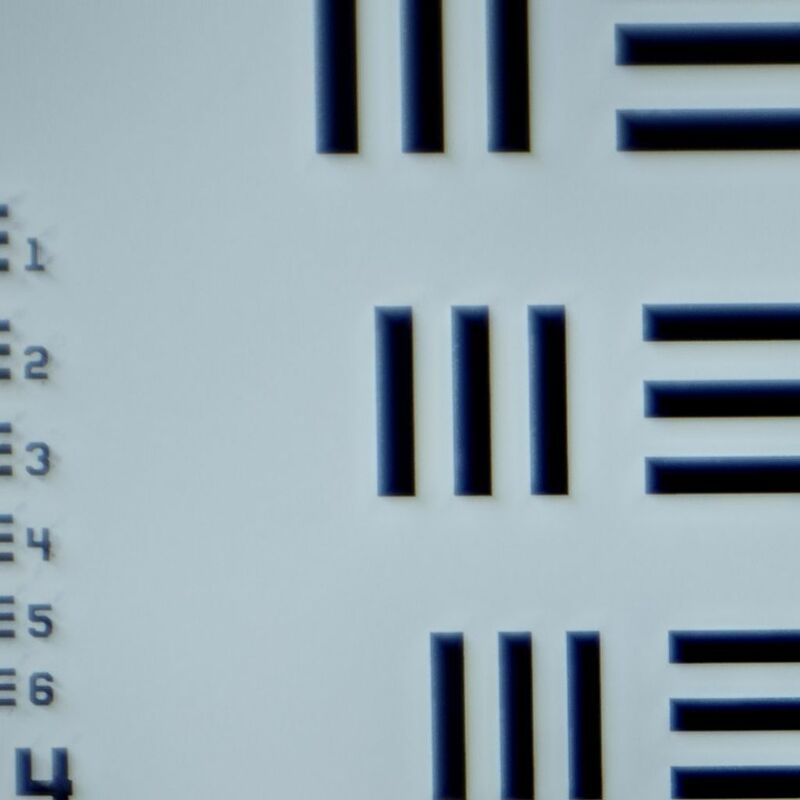 Here is the next chunk (of ~1000 pixels) over to the right of the corner. 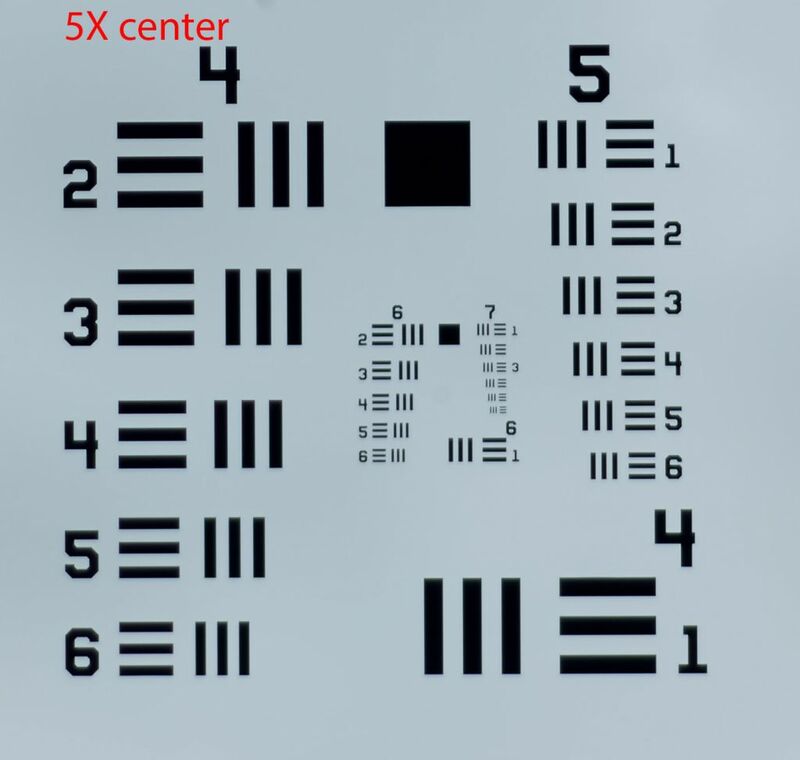 The 5X (maybe all of them, maybe just this particular objective) has a corner that isn't as good as the center. I think it is still plenty good enough for my purposes. But it is only really tight in the corner that this is an issue. The right edge and bottom edge of the next chunk over are a lot better than the absolute corner. The area that is degraded (less good) is probably <1% of the frame, or <4% overall counting all four corners. It's great. I could have done a better job of positioning the high res part of the target in the absolute corner, but I think it shows the point. The same thing is true for the 20X. Unfortunately when these were taken I didn't the res target far enough in the corner, so a 1000 x 1000 pixel crop of the 20X stack is all white.... 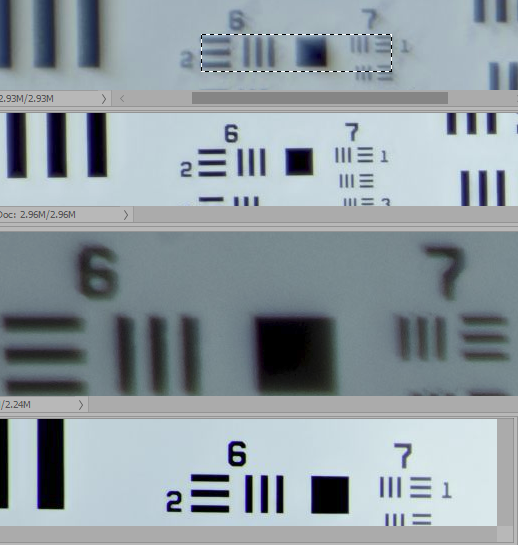 But when I look at the full res tiff it is excellent - better than the 7.5X and very nearly as good as the center. Having seen results for a few Mitutoyos, mostly care of Chris S., I have to wonder how much variation you would detect by your method from different examples of the same objective. 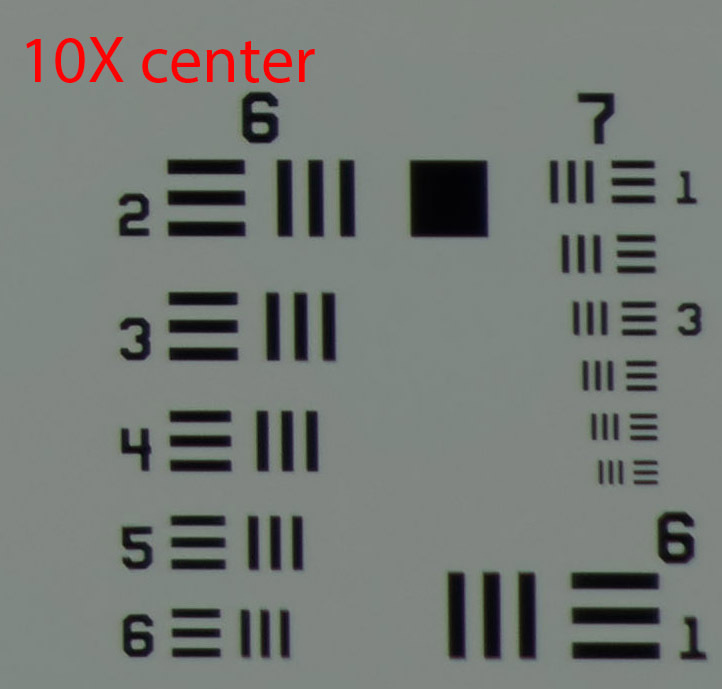 I have one 10x for example, which is OK centrally, but shows atypical CA towards the edge. It's a really good question, which I can't answer because so far I have only tested the ones I have. It is clear that the Mitotoyo objectives could meet all of their published specs without having good performance this far from the center. 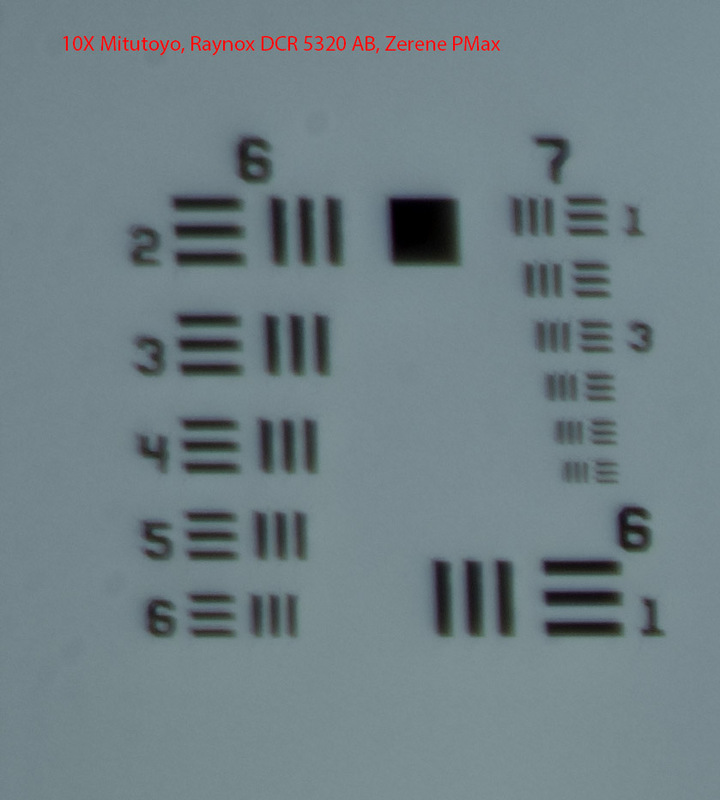 The Mitutoyo catalog does not mention an image field bigger than 30 mm. 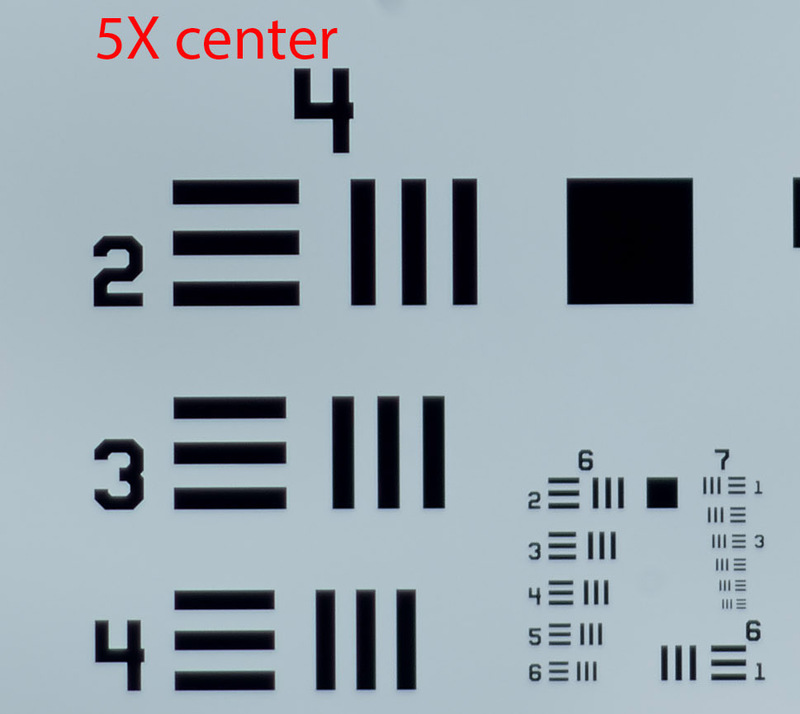 Yet the 7.5X and 20X are great at an image circle of 67 mm, which is more than twice as far. So, in a sense this is all a free extra. I think I know someone from whom I could borrow some locally to test, and if that works out I will post the results.